For mobile workers, it’s hard to beat the freedom and flexibility Internet telephony provides us. One of our favorite web services, GrandCentral, gives you the ability to have one phone number that can ring an assortment of phones including your mobile, landline, office phone, and any other place you’d like to be reached. Additionally, there are those who embrace the utility of a soft phone. A soft phone is an application that runs on your computer and allows you to send or receive phone calls, normally through a microphone headset. Skype is probably the most well known soft phone, but a competitor of theirs called Gizmo5 (formerly known as Gizmo Project) can be combined with GrandCentral to give you soft phone capabilities. This Gizmo/GrandCentral combination is made possible because of the two services’ use of SIP, a standard protocol for VoIP communication. Using Gizmo and GrandCentral together will give you absolutely free calling inbound and outbound to your callers, absent of using any cell minutes or using a landline. Follow this hands-on guide to enable Gizmo5 to be added as a phone in your GrandCentral set up. First and foremost, you must have a GrandCentral account set up and ready. Secondly, download Gizmo5 from their website and create an account. Gizmo5 is available for Windows, Linux, Mac OS X, and Nokia Internet tablets. Now that you have your two accounts on GrandCentral and Gizmo5 set up, it’s time to integrate them. Log in to your GrandCentral account and click on the “Settings” tab. In the Phones group, you can see where you have your various phones that GrandCentral forwards your calls to, according to your preferences. It is here that we will put in our Gizmo5 ‘phone number’ for GrandCentral to use. To find that Gizmo5 phone number, launch Gizmo 5 and under the Account menu, click on “My Profile”. In this window, shown on the right, you’ll see your SIP phone number. Write down this number, minus the 1 at the beginning and excluding everything after the @ sign. Now, go back to GrandCentral and click “Add/Edit Number”. In the dropdown, choose Gizmo, type in the SIP number found in Gizmo5, and assign a name of your choosing to the entry. Lastly, click “Save” to commit the change. Now, whenever you have Gizmo5 running on your computer, you have the ability to recieve phone calls without using your cell minutes or tying up a landline. All voice packets are carried over the Internet from GrandCentral to wherever your logged into Gizmo5 from. I want to use softphone in my java application. Instead of typing or entering the number, is there any softphone providing facility to pass phone number as parameter or value(Dialing through an URL)? or can we use phone number as links, which will direct to the number? You can initiate free outbound calls with this combination, but you have to do the dialing through the GrandCentral website. A little inconvenient, but it’s free. For now. 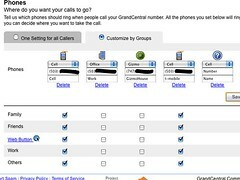 “Using Gizmo and GrandCentral together will give you absolutely free calling inbound and outbound to your callers, absent of using any cell minutes or using a landline.” Is that a typo in the post? There doesn’t appear to be any way to use this setup to dial out for free, and the post never details the setup for doing so. I have been using softphones for quite a while now. But now my focus has shifted to VoIP phones.Panasonic VoIP phones are the ones which i use now for my Business. I would love for Grand Central to work, but I’m afraid that it appears it’s not ready for prime time. I stopped using GrandCentral until you people become more transparent. Iâ€™d like to know if Iâ€™ll be able to use GC with Skype in the same way one is able to integrate Gizmo. Would love for GrandCentral to work, but clearly you have some management issues, despite the acquisition by Google. You people are really blowing it, in my opinion (and others). I wonâ€™t hold my breath and expect this comment to show on your blog. Whatâ€™s the deal with the â€œSubmit a Commentâ€ button if you donâ€™t print the comment? Be careful using GrandCentral for your business phone. I am a big fan of the concept however I received feedback from clients that using this number was causing them trouble. They were not always able to get through to me or in some cases were getting patched through to the wrong person. Also read the post at techcrunch about GrandCentrals recent outage. I have switched my number back to the land line until GC works out the bugs.